"There are only two cures for love: marriage and suicide." Buster Keaton referred to signing his 1928 contract with MGM as "the biggest mistake of my career." He had made himself one of the most beloved comedians on the screen with his independent production company, tailoring its method of working to his own improvisational methods. Unfortunately, this method also led to budget overruns and financial issues probably made going to one of the major studios inevitable. But Metro-Goldwyn-Mayer was probably the worst possible choice for him, since Louis B. Mayer and Irving Thalberg insisted that he work from a shooting script instead of just being turned loose on the set, with a few restrictions to keep him under budget. The result not only made his films an increasingly pale imitation of his earlier masterpieces, but led to the destruction of his career and no doubt contributed to his alcoholism. That said, Keaton did at least initially struggle with the studio to recapture some of his independent magic. This set collects the first three feature films from Keaton's MGM contract, the first of which is still a masterpiece, the second of which has its moments, and the third demonstrates that creative control had completely slipped away from Keaton. But even second-rate Keaton is better than most modern comedies anyway, so there's still plenty to enjoy here. The Cameraman (1928) features Buster as a tintype cameraman who meets and falls for Sally (Marceline Day), the secretary at MGM's newsreel department. Buster, in an attempt to win her affections from rival Stagg (Harold Goodwin), decides to become a newsreel photographer, but his attempts inevitably misfire even when he finds himself in the middle of action. The same mischievous monkey that was memorable in Harold Lloyd's The Kid Brother shows up here again too. Keaton is still terrific here, with his implacable resolution against fate; he soldiers ahead, not exactly cheerfully, but makes the best of the situation. Showing up at Yankee Stadium for a game, upon learning that it's actually a road game, he plays a game with himself. Day (best known today as the female vampire in Lon Chaney's lost film London After Midnight) is adequate as the love interest, and she has a few good moments, especially at the end, when it dawns on her how she has been deceived by Stagg. During the epic Tong War sequence, a setpiece that rivals almost anything in his own features, Keaton gets off one great stunt but after this MGM refused to let the bankable star take the risks that he was so well known for. Keaton developed an odd fondness for the name "Elmer," naming all of his dogs thusly and using the character name for Spite Marriage and in many other pictures for years to come. Here Elmer is a pants presser who masquerades as a millionaire in clothes borrowed from his customers in order to impress actress Trilby Drew (Dorothy Sebastian). But she is in love with Lionel Benmore (Edward Earle), who reveals that he's engaged to Ethyl Norcrosse (Leila Hyams, of Freaks). Enraged, Trilby demands that the star-struck Elmer marry her, and soon regrets her rashness. Her manager steps in to split them up, but Elmer is soon in trouble after he witnesses some rum-runners, leading to nautical adventures. While the first half holds together pretty well, and the seagoing comedy bears quite a few hallmarks of Keaton's humor, the script is something of a mess. The gangster thread doesn't work very well with the rest of the picture, and even though Keaton was having an affair with Sebastian at the time, there's really little in the way of sparks between them. The main reason to see this film is the classic routine of putting the drunken Trilby Drew to bed, a real throwback to Keaton's early silent comedy, and a gem of humor that still holds up well today. Keaton's first sound film, Free and Easy (1930), finds him making good use of the MGM lot as well as many notable names, playing themselves. Buster stars as Elmer J. Butts, manager to Miss Gopher City, Kansas, Elvira Plunkett (Anita Page) while she attempts to start a Hollywood career. But Elvira has along her domineering mother (Trixie Friganza), who has little use for Elmer and is the traditional stage mother. Unfortunately for them, Elmer ends up getting roles in films (with silent film director Fred Niblo playing himself). Alas for Elmer, his love for Elvira seems in danger of being swept away by dashing Larry Mitchell (Robert Montgomery). Keaton actually had no problem making the transition to sound; his voice pretty well suited his visual character, sounding plenty deadpan. The drinking is clearly taking a toll, though, since he has quite visibly aged from just two years earlier. He doesn't get to be nearly as interesting as in his earlier films, however, and just seems to be written as a woeful idiot, rather than the brave little man facing overwhelming odds. This role would plague him for several years, until MGM finally unceremoniously fired him, after several ill-advised teamings with Jimmy Durante. Sound doesn't add much to the film except unending musical numbers, and really keeps Keaton from doing any hugely extravagant setpieces such as he loved. Probably the most interesting facet of this production is the behind-the-scenes view of early sound filmmaking: during the making of the musical film onscreen, an orchestra is there on the soundstage with the actors, playing away. It's an amazing glimpse, as are the looks at Niblo (who is quite funny himself), Lionel Barrymore and a rather stiff Cecil B. DeMille. Even though it's the least of the films in this collection, there are still some very good segments, especially as Elmer gets caught up in a tongue-twister of a line. Friganza is entertaining as a cross between Marie Dressler and Margaret Dumont. The finale is quite unsatisfying, however, and the last half hour could have used some judicious cutting to improve the leaden pacing and monotonous songs. The grade is for the two silent films only, considering Free and Easy as a throw-in of sorts. Image Transfer Review: For the most part, these films look very nice. The Cameraman, which was used as a prototype for comedies by MGM for many years, suffers the most, with decomposition and several chunks that have completely gone missing. There are scratches and dings throughout but the photography looks good, with nice contrast and greyscale. Spite Marriage looks the best of the three films, with some segments that are just beautiful. Free and Easy doesn't seem to have had much restoration work done on it, since there's evident wear through much of the picture and some insert shots seems like 16mm dupes. On the whole, quite satisfying, especially in comparison to the poor prints that are usually seen for The Cameraman. Both of the silent films feature the original intertitles, and the credit sequences for all three pictures are windowboxed to avoid overscan problems. Audio Transfer Review: The Cameraman has an organ score by Arthur Barrow, and sound quite good. Spite Marriage has a period music-and-effects track that is unaccountably missing any significant noise, hiss or clicks. There's the expected lack of range and presence but it's quite acceptable. Free and Easy has quite a lot of hiss and noise, and music often sounds rather muffled, but that may be due to the primitive recording conditions more than anything. Dialogue and lyrics sound fine, and Keaton gets to show off his singing voice a couple times, including on the title song. Extras Review: The first two films include intros by TCM's Robert Osborne; they give some decent background in their brief running time. More substantial are full-length commentaries from three Keaton authors on these two pictures. Glenn Mitchell resorts to IMDB-style credit recitations far too much and has an odd defensiveness about Keaton's reputation as the Great Stone Face. The commentary from John Bengston and Jeffrey Vance tends to focus a bit much on the locations where various sequences were shot (not surprisingly, since Bengston wrote a book on the topic of Keaton's locations) but on the whole is more satisfactory despite having a few lapses of silence. These two pictures also get photo montages of over 40 stills each. Free and Easy has no extras per se, but the second disc does include the excellent documentary So Funny It Hurt (sloppily given as Hurts on the menus) by legendary silent film historian Kevin Brownlow. Having done a lengthy documentary on Keaton already, Brownlow here focuses almost exclusively on the MGM years in this 38m:18s film. There are quite a few clips, interview footage from Keaton that looks to be from the early 1960s, as well as reminiscences from friends. It's not just restricted to these three films, but covers the entire MGM period plus briefly discusses his career afterwards as a gag writer for the Marx Brothers and Abbott and Costello. Best of all, it includes Red Skelton's reenactment of the lost footage from The Cameraman. Both of the silents are certainly worthwhile additions to any film collection in their own right, while Free and Easy is if nothing else a treasure of a document of 1930 Hollywood. 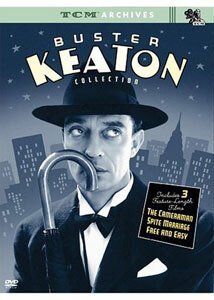 The extras are very good, especially the documentary, which puts this epoch of Keaton's life into vivid perspective.